Founded The family acquired the property in 1670. Jean-Pierre Thibon created the domaine three hundred years later in 1970. In the old days, Mas de Libian was a noble household, used predominately as a hunting lodge. In 1670 the Thibon family acquired the property; in 1970, exactly three hundred years later, Jean-Pierre Thibon took up management of the domain and put in a wine making cellar. The cellar was built with the aid of friend Jean-Pierre de Monmollin, a collaboration that produced the name Caves des Deux Jean-Pierre, which can still be found stamped on the domain’s corks. Jean-Pierre Thibon and his wife bore three daughters, all of whom work in wine. 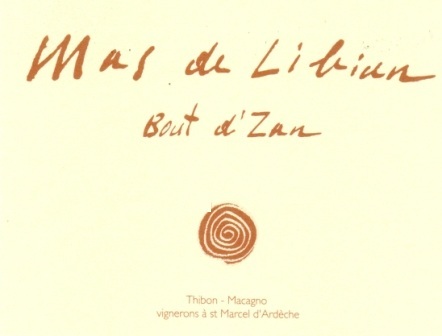 In 1995 he created the company Mas de Libian—Libian being the name of the neighborhood—with his eldest daughter Hélène, middle daughter Catherine, and Hélène’s husband Alain (the youngest Thibon daughter works in Bordeaux as an enological researcher). Today Hélène, Catherine, and Alain tend to the domain’s twenty-four hectares (59 acres) of vines and its wine, working as a family collective. Parents Jean-Pierre and Jacqueline are very much the anchors. 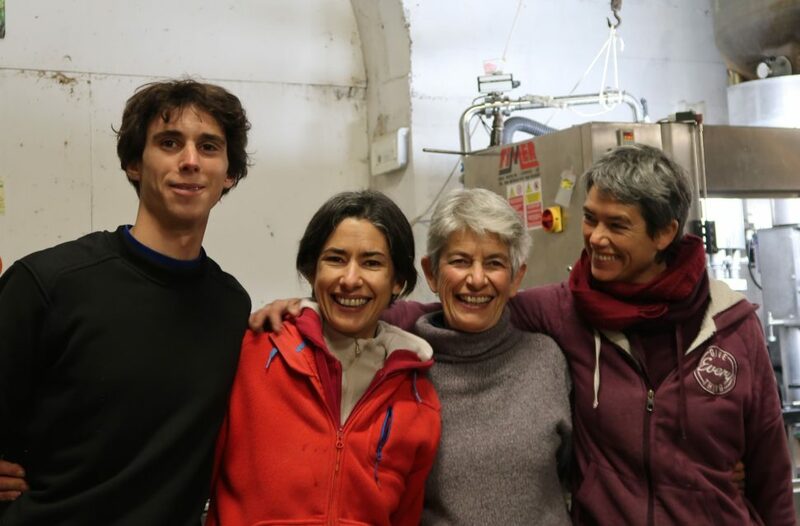 Below, left to right, are three generations: Auzélien (Hélène’s son), Hélène, Jacqueline, and Catherine, taking a quick break from bottling. The domain is just outside of Saint Marcel d’Ardeche on the Rhône River’s right bank, in the northwest sector of the Côtes-du-Rhône. Two important facts stand out about this location. First, the majority of the Thibon vineyards (all of its Côtes-du-Rhône Villages and part of its CdR appellation vineyards) grow high on top of an ancient river terrace—the same terroir as much of Châteauneuf-du-Pape with its galets roulets, or rounded stones, clay, and sand. This terrace rises up steeply behind the domain. Effectively, it’s a giant gravel mound, washed up into a terrace by glacial torrents a bygone era ago. Vines love the drainage given by gravel and the depths offered to roots. 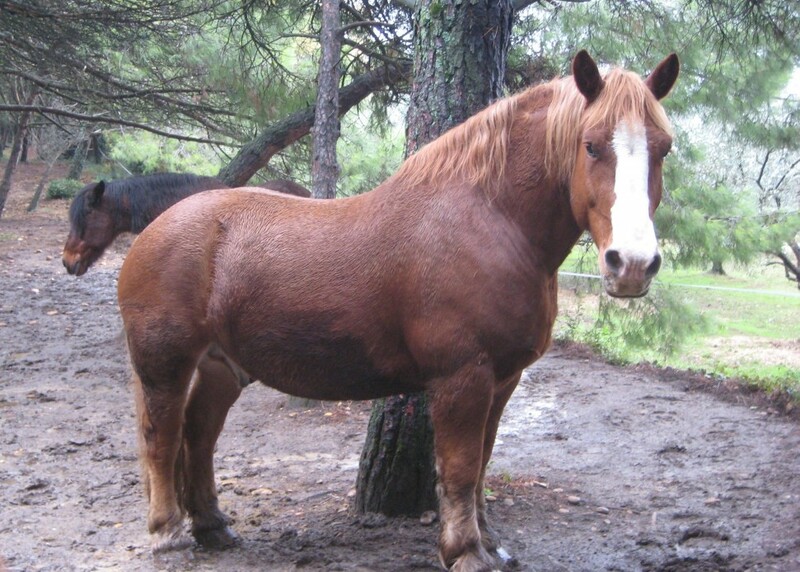 These days the domain is certified biodynamic in its farming. This is simply an extension of the practices of the family over generations, for pesticides and herbicides have never been used at Libian. Nestor, a rugged Comptois workhorse, is used by Catherine to plow ten hectares worth of vineyards; the rest Alain handles by tractor. The wines are made in concrete vats with, the cuvée depending, a portion being aged in large old foudres or older demi-muids to emphasize fruit (“Wine,” says Hélène, “is made from grapes, not wood.”). Please note that the CO2 resulting from fermentation is kept in the wine as protection against oxidation–permitting a much lower addition of SO2–thus all of the Libian wines benefit from decanting. This allows the gas to quickly blow off and permits the wine to blossom into its true form. Intervention in the cellar is kept to a minimum. Care, passion, and familial effort are expressed to the maximum. We represent this wine regionally, in California, rather than nationally. Roughly 75% Grenache with 25% Syrah Pétanque refers to the Provençal game of boules, and this wine is made in the spirit of fun and camaraderie. From young vines growing in their CdR and CdR-Villages parcels. Made in concrete vats. Vineyard surface totals 21 acres. 3,000 cases annually. Drink this with a slight chill to it. Bout d’Zan Côtes du Rhône 80% Grenache, 20% Syrah This was Jean-Pierre’s nickname as a kid. Zan was licorice; bout was a bit or bite, Jean-Pierre was a darkly tanned scrawny little kid. It’s easy to taste licorice in the wine too. This comes from a mix of terroirs—the galets roulets sand and clay mix on top of the terrace, and from parcels lower down with active limestone. 1/3 aged for roughly 7 months in old foudre, while the remainder is raised in concrete vats. Total surface is 17 acres. Just over 3,000 cases annually. Based on Grenache, with some 15% Syrah and 10% Mourvèdre Named in honor of the 11th century Persian poet and mathematician, this comes entirely from 11 acres in the galets roulets terroir. Like Bout d’Zan, it’s aged 1/3 in foudre (although usually for a longer period) and 2/3 in concrete. 2,000 cases annually. 90% Mourvèdre, 10% Grenache Calade is an old Provençal argot for a stony path leading uphill, which accurately describes how the Thibons get to their vineyards each day. From a very low yielding 2.5-acre parcel. Vines planted in 1970 and grow in a layer of galets roulets that measures a solid 10 feet in depth! 1/3 is aged in older demi-muids barrels (600-liters), 2/3 in concrete.